Most university and college students will have been offered Ecstasy at some stage over the course of their studies. This substance is known as the party drug and is strongly associated with certain types of dance, house and trance music. It’s not uncommon to be offered Ecstasy in a club as it is easy for dealers to carry them around and hand to people without much trouble. During the nineties, raves became very popular and ecstasy was passed around like Smarties, many tended to walk around with water bottles rather than glasses of alcohol! 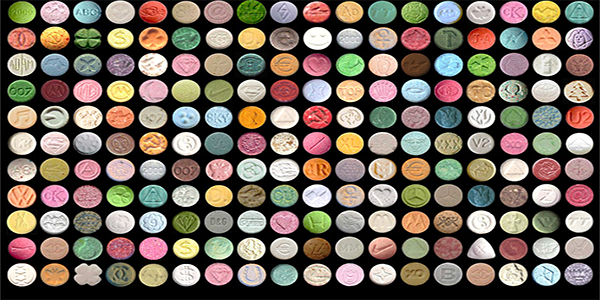 Many people died as a result, yet ecstasy continues to be a huge problem in society. Interesting Fact: Ecstasy is known to cause jaw-clenching and teeth grinding in sleeping individuals, this can wear down teeth and the general health of the mouth over time and prolonged use. The most common reason students first try ecstasy is that they just want to experiment, like most available drugs. They might be attracted to the fact that taking ecstasy will mean they could get the energy needed to party all night. One of the most common reasons why individuals keep using this substance is that they enjoy the euphoric feeling, which can last for hours. They might also like the fact that it makes them feel so good around other people – it is often referred to as the ‘hug drug’ because of the increase in the want to be social. Another reason why people continue taking this drug is that they enjoy being part of the community that uses it which is stereotypically at raves and clubs in which everyone is dancing. Forgetting to drink fluids, meaning that they can develop heat exhaustion. Becoming very paranoid and anxious. Making very poor decisions – this is something they could deeply regret later on. Leading individuals to develop mental health problems. Damaging almost every organ in the body. Regular use leading to mental addiction. Experiencing life as very flat or boring when they are not on the drug. Leading to long-term sleep problems. Use or addiction can lead to social problems with family and/or friends. Interesting Fact: A study seems to suggest that the prevalence of Depression and Anxiety is very common among MDMA users, even after quitting the drug. 60-90mg is the average dose of a single Ecstasy tablet; it would be wise not to take any more than this as it can lead to vomiting, extreme headaches and other unpleasant side effects. Drink water to counteract the dehydration of the drug. Try to stay with trusted friends/family when using the drug in case of an emergency. Remember that Ecstacy is a class C drug as of 2013 in the UK meaning that you can receive a warning or fine for carrying small amounts of it, or be sent to prison for carrying a lot and/or dealing. Addiction to MDMA differs from other types of addiction because most people will not experience physical withdrawals when they try to stop. They can, however, really struggle with the psychological aspects of giving up. This is why, in many cases, the person addicted to ecstasy will need to get some type of help. Spending time with an addiction therapist is one option, and there are self-help recovery groups that will be able to help as well. Those individuals struggling to break away from this type of addiction may need to spend some time in rehab. Read more about children and students with addictions in our student addiction guide.